We have shipped thousands of Continuous Flow Systems in the last 3 years. It is our policy to help solve any problems that develop with our CFS units. We have a large base of knowledge on Continuous Flow for Epson printers because we invented it and continue to support it. Here are the 10 most common problems we encounter and the solutions that go with them. My CFS has been working fine for 6 months, and then it stopped working. I have to run many cleaning cycles every day before using printer. I Can't get a good nozzle pattern. I start with a good nozzle pattern, but print breaks up on first or second page. I have lost one of my colors (usually black). I lifted up the cartridges and now I can't get it going again. Foamy ink inside the cartridge is the cause of all of the above symptoms. It gradually builds up and needs to be flushed out about every 6 months. The flushing procedure is not difficult. After the ink foam is flushed out the system returns to normal. Lifting the cartridges will also create ink foam inside the cartridge. Even on systems built with original Epson cartridges, it still happens. 1. Remove the Continuous Flow Cartridges from the printer. After removing, do not turn upside down. Keep the cartridges at approximately the same level as the bottles. If you used MIS Rivets in your initial install, then put a rivet in each of the exit ports in the bottom of the cartridge. If your CFS was purchased after June 2001 then it has internal poppet valves and the rivets are not needed. Keep the tubes in the bottles and set the whole assembly aside for now. Install a brand new set of Aftermarket cartridges or a set of Epson carts that still have life (ink) in them. The Aftermarket carts have to be un-punctured, new ones. If you use your Epson carts, they can not be a refill of the originals. Brand new Epson carts work the best. This step is very important, do not skip this step. 2. Use the new cartridges to bring your printer nozzles back. Run cleaning cycles in groups of 3. Check nozzles before and after each cleaning. Stop if you get a perfect nozzle pattern. After 3 cleanings, print a copy of the PURGE4 or PURGE6 image. Then, you can do 3 more if needed. If after 9 or 12 cleaning cycles, and your printer is still not working properly, give it an overnight rest. Many times, the nozzles will recover on their own after an overnight waiting period. Download purge.zip (59kb) to get all the test patterns. When you have your printer making perfect copies of Purge4 or Purge6, then you know your nozzles are all working properly. Print the purge images at 360 dpi, plain paper. This is an excellent way to validate the nozzles. Once you know there are no problems with the printer, then you can proceed with bringing the CFS unit back to normal. If you can not get the printer nozzles back after doing cleaning cycles with new cartridges, then it is time to call Epson and get some of there help. It is not a CFS issue at this point. If you do talk with Epson, don't mention 3rd party inks or continuous flow systems. Just tell them you are using Epson cartridges and explain the problem. Use this link to find the correct Epson phone number. They change this link often, so it may not always work. Your printer manual should also have the number to call. 3. Now that you know your printer is working fine, it is time to work on the CFS unit. Obtain a syringe (60 cc, 30 cc, or 10 cc) and a MIS Bottom Fill Adapter. Attach the bottom fill adapter to the syringe. Insert the bottom fill adapter into the bottom of the cartridge, and pull back slowly. This will draw ink from the bottle, through the tubes, into the cartridge and then into the syringe. Make sure you have more than enough ink to fill the syringe. You do not want to pull air into the cartridge. The ink that appears in the syringe will have foam or air bubbles in it. This is what is causing the problem with the CFS. The printer will not print foamy ink or ink that has air	bubbles in it. You have to get the foamy ink out of the cartridge. Take the top off the ink bottle and dump the ink from the syringe back into the reservoir bottle from where it came. There should be no loss of ink doing this procedure. The foamy part of the ink will break down into liquid in about 2 hours. Put the top back on. Then draw another syringe full of ink from the cartridge (same color). Dump it into the reservoir bottle. Keep doing this until the ink that comes out is free of any foam or air bubbles. It takes at least 100 cc of ink to achieve this. In other words, 10 syringes full using the 10 cc syringe or about 2 syringes full using the 60 cc syringe. As you approach 100 cc, you should see less and less foam in your syringe. You will always get a little foam, especially if you pull hard and fast on the syringe. Do it slow. Repeat the process for all chambers or colors in the cartridge. Be sure to wash out the syringe and bottom fill adapter with warm water before going to a different color. If you are using rivets, only open one chamber at a time, keep the others blocked so you don't get cross port contamination. Remove the rivets and reinstall the cartridge in the printer. Run cleaning cycles in groups of 3 until you get a good nozzle check. Print a few copies of our purge4 or purge6 diagrams after 3 cleaning	cycles. This should correct the problem. If it doesn't, then let it rest over night, and try again in the morning. I tried to flush out the foamy ink using the above procedure, but I can't get any ink to come out. Go back to the INK FOAM BUILD UP solution and follow it down to the point where you try to pull ink out of the bottom of the cartridge using a syringe with a bottom fill adapter. If you meet a lot of resistance when pulling back on the syringe plunger and no ink is flowing into your syringe, then, you most likely have a blocked line. We have seen this happen mainly with the black inks. There is no good way to flush out the line or unblock it. The blockage is usually algae or long chains of ink that are changing to a solid. A new tube is the best way to remedy this problem. Call (248-690-7612) or email us, and we will send you a new tube. While you are waiting for the new tube to arrive do this. Remove the tube from the barbed fitting on the cartridge. This can be difficult, use a little heat if needed. When it snaps off, it may fling ink onto you and your surroundings. Cover your hand and the fitting with a cloth or rag to capture the ink that may fly. If you pull straight, the tube will come off without damaging the fitting. If the fitting gets damaged, let us know and we will replace the cartridge and the tubes. Un-web the blocked line from the other tubes. You will have to re-web this tube back in using tape when you get the new line. If you have more than one blocked line, then request a complete ribbon tube. While you are waiting for the new tube, Install a new cartridge (without tubes) in the printer. This will require that you re-install the original cartridge hold down clamps. Run some cleaning cycles and get the printer back to normal. When the new tube or cartridge with tube arrives, make sure all nozzles are perfect, then install it in the printer. Use some black electrical tape to re-web the new tube to the old ones. If you got a new cartridge from us, and it is empty, you will have to recharge it with ink, like you did during the initial installation. Use either bottom fill or vacuum fill technique. Run some cleaning cycles and make some prints. If there is air in the new line, don't worry about it. The ink will climb up the line and reach the cartridge. The air that is ingested into the cartridge is not a problem. It will add to the siphon break (read about this below). For installations in hot dry climates, or for those who do not print frequently (less the once per day) we recommend installing a program on your computer that will make a print of our test image, PURGE6.JPG, once per day, at the time you designate. If you are using a PC with Windows, there is Task Scheduler built in to Windows. Use the Task Scheduler to execute AUTOPRINT. Autoprint is a program written by one of our customers to do the printing. Autoprint can be downloaded from our website. It is free. If you have a Mac or early Windows machine, then there is software available that will achieve the same results. One of these companies is Peerless. I can't get the red light on the printer to go off. F-16 Resetter will not turn off red light on printer. If you have an older printer, without chipped cartridges, this means that you have to reset your CFS so the printer will think is has new cartridges. The instructions for doing this are in the installation document that came with your CFS. If you can't find the document, go to our instructions page, where you can read the PDF document for your printer. If you have a C60, C62, C80, C82, C84, 820, 870, 890, 1270, 1280 or 1290 printer and the printer red light is on, this is a chip related problem. If you have printed enough so the printer believes it is out of ink, then you should be able to reset the chips to full by turning the printer power off for 10 seconds and then back on again, or by using your F-16 (if you have one). If this does not work then, it is either a chip alignment problem or the chip on the cartridge is damaged electrically. A mis-aligned cartridge or damaged chip will cause the printer red light to stay on, no matter what you do. 1. Reseat the Cartridges. If you have one installed, remove the tie wrap holding the cartridges down. If you don't have one installed, this may be why you are having red light problems. In any event, try reseating the cartridges by lifting them only 1/8 inch. Twist and rock them as you put them back down, so they will find the true center position. They must be tight or snug and not loose. After doing this, turn on the printer to see if the problem is solved. If it is solved, you can put the tie wrap back in place. If you don't have one, you can operate without it for a day or two, but long term it is required to make sure the carts don't creep up and loose contact with the chip. Click here for instructions on how to replace the tie wrap. 2. Replace the cartridge chips. We have the chips available, call us (248-690-7612) and we will mail you a couple of chips. No charge if your unit is still under warranty. Or if you can't wait, get a useable (not empty) set of cartridges and swap the chips from the good carts to the CFS carts. Of course these will not be Auto Reset chips and they will show empty after you used them for awhile. Hopefully they will last long enough so the replacement chips can arrive. A word of warning. When you are having red light problems, it is best to introduce	new or different chips to the printer with the POWER OFF. Disconnect the cables from	the back of the printer and pull the power plug out of the wall. Then move the	cartridges over to the left and put the new carts with new chips in the printer. Be sure to move the carts back the FAR RIGHT before turning the power on. Also, make double sure that the carts are seated down all the way in the cartridge holder so they are making contact with the small fingers that read the chip. 3. Use the F-16 Chip Resetter. If your unit came with an F-16 Chip Resetter (see photo), then follow the instruction manual sections 4 & 5. Before you start this process, turn the printer off, unplug both the printer and the F-16 and disconnect the computer interface cable from the printer. Then follow the instructions in section 4 and 5 of the F-16 manual. My printer puts small dots of unwanted ink on the paper. My printer spits blobs of ink onto the paper during printing. I get extra ink on the edges of my paper. I have ink on my rollers and it makes marks on the prints. We have designed a siphon break into the Continuous Flow System. Without a siphon break, the ink can start to flow from the bottles into the printer on its own, making a huge mess. Our filling technique leaves about 5% of the cartridge volume empty. This empty space is an air pocket at the top of the cartridge. When ink comes in from the supply tubes, it drips on the sponge and becomes available to the print head. Without the siphon break, the cartridge would be 100% filled and a solid column of ink would exist between the bottles and the print head. When the printer starts to print, it is like sucking on a tube to start a siphon. Once the siphon starts, the ink will flow on its own, by gravity. Our filling method prevents this. If my printer is spitting, how do I stop it ? If your printer, with CFS installed, spits out small blobs of ink onto the paper, this is caused by not having a siphon break at the top of the cartridge. The siphon break can be re-established and the spitting will stop. Tell your printer to print 50 or more pages of our PURGE6 or PURGE4 image (at bottom of Archival page).. Use cheap paper or the backside of used paper. While the printer is printing, unscrew the caps from the ink bottles, remove the tube from the ink, so the tube is no longer under the ink. Set the tube/cap down next to the bottle. Let the printer continue to print. The ink in the tubes will begin to disappear. When the ink is almost gone from a tube (inks are used up at different rates), then reattach the cap to the ink bottle so the tube is now under the ink surface. Do this for each tube. 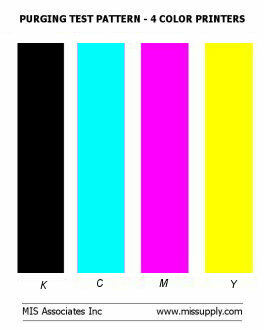 If you can't see the ink move in the tube, then print 10 full pages of that color, 8x10 image. This is enough to remove the ink from the tube. Don't get the tubes and bottles mixed up when you put the tube back into the ink..
Continue printing. When the inks have all reached the cartridge again, you are finished. This procedure puts one tube full of air into each chamber of the cartridge and reestablishes the siphon break. Clean up your printer so there is no loose ink on the rollers or elsewhere. The spitting problem should be solved. If you have a lot of loose ink in your printer and on the rollers, try this. Get a clean sheet of paper and soak it with rubbing alcohol. Manually feed it into the printer by pushing the paper feed button. Do this several times (10 or more). The alcohol will mix with the ink and dry it, and it will also clean up the rubber grippers and rollers. One or more of my tubes are totally empty in the morning. The MIS CFS is designed to have some air space on the top of the cartridge. This air space acts as a siphon break. If it were not present, there is a chance that ink could siphon directly from the bottles into the printer making a huge mess. If you see any small bubbles in the ink lines, these will be absorbed by the air space in the cartridge. It is not something to be concerned about. The air space on the top of the cartridge will expand and contract with changing weather conditions. It is not unusual for the ink to retract as much as 6 inches from the cartridge when the printer is not being used. This is just the effect of the air space on the top of the cartridge expanding. It does not mean there is something wrong. However, if the ink in the lines totally disappears and drains back to the bottle, this indicates that there is a leak in the line. This is a serious problem and the CFS cartridge should be replaced. I just came back from vacation and my printer does not work. I do not print frequently, and I am having problems with my CFS. While you are gone, if the printer is not in use, air can come in backwards through the print head and get into the cartridges. When this happens the ink inside the cartridges can get foamy, and foamy ink is what causes the nozzles not to fire. With the inks below the print head, as they must be to operate properly, there is suction on the print head caused by the inks trying to get back into the bottles. Raising up the bottles 1 inch above the desktop (do not exceed the 1 inch) will help reduce this suction. Air can only get in, if the seal surrounding the nozzles is leaking. Cleaning the rubber gasket that is on the outside perimeter of the dump sponge will help prevent air from getting at the nozzles. Make sure your printer is in a cool place and not exposed to sunlight. This helps keep the inks from drying. 1. �� Move carriage to left. Clean the rubber gasket around the "cleaning cycle dump sponge" on the far right. Use a cloth with hot water on it to do this. This area needs to be kept clean, especially the gasket. It is used to seal off the print head from air, when you are not using the printer. 2. �� Raise up your ink tray a little, not more than 1 inch. A paper back book works good. If you raise the inks too high, they will pour right into the printer, so don't go over one inch. 3. �� Before you leave, run your printer and make sure that you have an absolutely perfect nozzle pattern. A good test is to print about 10 pages of our purge6 diagram, use the printer default settings. If you don't see any banding or skipping, it is running as good as it can. 4. �� Make sure your printer is not exposed to any direct sunlight. The heat from the sun can cause the inks to dry in the tubes and in the print head causing problems. Because we use clear tubing, the sunlight hitting the tubes can accelerate bacterial reactions inside the tubes. So	keep your system out of the sun while you are away. A cool basement area is an ideal storage	place. Heat, low humidity and sunlight can cause problems. 5. �� When you get back, print something. If you have missing nozzles, run a few cleaning cycles to recover them. Remember, do cleaning cycles in groups of 3, then print something (purge image) and you can do 3 more if needed. If repeated cleaning cycles do not bring your printer back to life, then go to the first section on INK FOAM BUILD UP. Follow the procedures outlined there. My tubing is getting caught on the printer. My printer stops because the tubing in getting caught. I keep getting premature red lights. Tubing is too tight in bracket, I can't make adjustments. My tubing bracket does not stick to the printer anymore. If your tubes are separated too far back, they may be getting caught and causing your printer to lock up. Click here for a solution. If you don't have enough slack in the tubing, they will pull on the cartridges and cause them to lift up. If they lift up, even slightly, you will lose contact with the chip. If this happens, you will get a premature red light. You need to re-adjust the amount of slack in the tubing. The ribbon tubing material has a very high friction coefficient. It tends to stick to the material the bracket is made from. Some rubbing alcohol will solve this problem. Use a paper towel and put some alcohol on the tubing. This will make it easy to assemble. If the tubing becomes too loose in the bracket, warp some black electrical tape around the tubing to make the bracket grip the tubing tighter. While the alcohol is wet, move the tubing in the bracket to add more slack. If your bracket came loose, then you need to get some double sided foam tape from your local hardware store. Clean off the tape residue using mineral spirits and alcohol. Make sure the surfaces are dry and clean. Re-apply the foam tape to the bracket and attach to printer. If the surfaces of the printer and bracket were cleaned with alcohol first, you will get a good bond, and they should never come lose, unless you don't have enough slack in your tubing, as described above. My printer bangs violently against the right side. The paper feed does not seem to work, I get misfeeds. My printer lights are flashing and I have communication errors. My printer prints off the paper on the left side. These symptoms are primarily associated with the 1200 printer. The problems are caused because the belt jumped. The belt can jump if the main shaft needs lubrication or if the ink tubes get in the way of the moving cartridges. We have re-designed the 1200 tubing bracket to eliminate this problem. It now has a 45 degree bend in it. Call us if you need one, there is no charge. To stop the banging, first remove the cause of the problem. Install a new 45 degree bracket to prevent the tubing from dragging on bottom of printer. With printer on, pull the power plug out of wall. Cartridges should be in their right hand parked position. Find the small white lever that is under the black cartridge holder. Not under the cartridge, but under the cartridge holder. You may need a flashlight. Move this lever, using a small blade screw driver, to the front. It moves about 3/4 of an inch. With the lever in the forward position, the cartridges can be moved by hand. The power is still off. Slide the cartridges to the far LEFT position. Move them all the way to the left until they stop. With the cartridges on the left, plug the power back in. If front panel power light is not on, then push it on. The printer belt will jump, and re-establish its home position. The cartridges will end up in the parked position on the right. This should correct the banging problem. If it doesn't then, it is time for Epson's help. My prints come out all black. My prints have a red or blue cast to them. If your prints are all black, you either have B&W inks or you have your printer set to print black only. Double check the cartridge numbers you ordered and received. If there are any Q's in the part number, these are B&W inks. Check your printer settings, to make sure you have the color button checked and not the black or grayscale button. If you prints have a color cast to them, then check your inks using the swab method and compare the colors to the ones shown on our swab page. You do this by using a q-tip and dip into each ink bottle and paint a 1 to 2 inch spot on a piece of Epson Archival Matte paper. The colors may not be exactly the same as we show, but the sequence should be accurate. If your color sequence is wrong, then this is the problem. You will need a new CFS cart and correct inks to remedy this. If you have not connected the right tube to the right color bottle, this will cause major color problems. 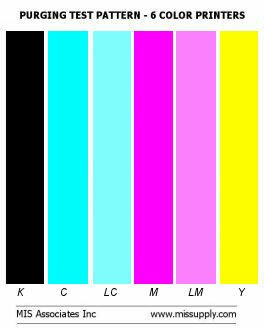 On the top of the cartridge, as installed in the printer, looking down on the carts, from left to right the colors are K,C,M,Y (4 color printer) and K,C,Pc,M,Pm,Y on a six color printer. Trace your lines back to the bottles to double check your installation. If there is a problem, you will need a new CFS cart to remedy it. You can submit a support request us for technical support. Please do not go into a long detailed explanation of the problem. Keep it to one short paragraph. We will start a dialog with you to help you solve the problem, by asking you questions. Our first question will be "HAVE YOU READ THE TROUBLESHOOTING SECTION AND THE FREQUENT QUESTIONS ON THE WEBSITE?" While you are waiting for assistance, remove your CFS and install Epson cartridges. If the printer works well with cartridges, then most likely it is a CFS problem and we can solve it for you. If it is a printer issue, you will have to call Epson for assistance.